If you are looking for information on the Custom carved and designed Area Rugs, please go here: Designer Area Rugs. Just like the custom designed and carved area rugs, some of the beginning foot work is the same to create the Sculptured walls, triptychs, etc. Gino works in marble, acrylic, corian, wood, and many other materials. If you have another material in mind, just ask him about the possibilities of working in it. He&apos;s very versatile. 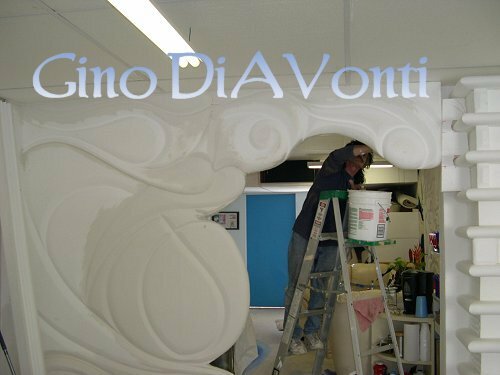 Gino sculpts out entire slabs of custom designed walls. The photo shown is for a modern look, and took Gino about a month to carve and install. Painting came next. The designs he can create are unlimited. From contemporary to traditional, even ancient reproductions are easy for him to duplicate. Just give him an idea of the style, and he will be able to do it. 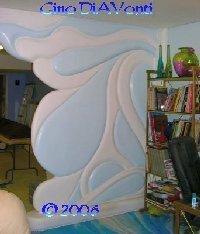 Click on either Wall Sculpture Photos for an enlargement. Whether you already have a design you&apos;d like Gino to create to full scale, or would like to collaborate on a custom sculpture, please feel free to call Him with any details or questions you may have. Gino begins with either your ideal, or if you need him to come up with the design for the sculpture, he can do that too. He will need to see the room in question, or you give him the basic idea of what is the style/period in time, etc. that is called upon by the Client. From there, Gino and you can talk out what might be appropriate, and he can then sketch out something that may be workable. If it&apos;s impossible for you and Gino to work together in person, don&apos;t let that stop you from booking a potential client! With the advent of the Internet, E-Mail, .jpeg and .png files, of course the phone, and overnight with FedEx; there is nothing stopping you and Gino from creating a sculpture that will be unique and original to your client. Contact Gino (Nichole will direct your call) today for more detailed information. Phone number is 239.895.7681. Call between 10:00 am and 6:00 pm please.